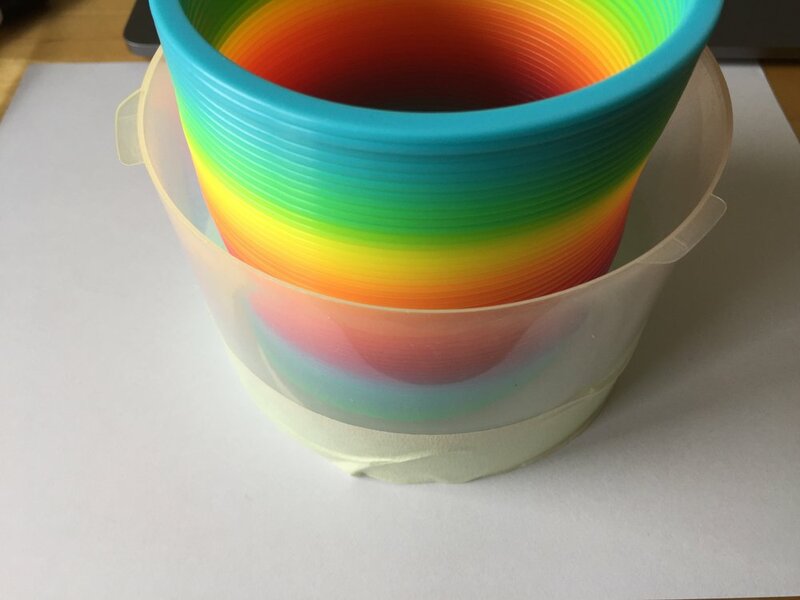 In my latest lecture on Lean Entrepreneurship, I used the toy Slinky in order to transport some of the key messages of “Build-Measure-Learn”-Loop. The loop is one of the pillars of “The LeanStartup”-approach. The idea of Build-Measure-Learn is that entrepreneurs (incl. intrapreneurs and corporate entrepreneurs) don’t build their initiative based on assumptions, but on validated learning, when searching for a repeatable and scalable business model. With every iteration, an entrepreneur runs an experiment to de-risk the most critical assumptions. At the end of every run through the cycle, an entrepreneur needs to decide whether to persevere on the current path or to pivot to a new path. The Build-Measure Learn cycle can also be seen in Slinky. "Slinky is a toy - a precompressed helical spring invented by Richard James in the early 1940s. It can perform a number of tricks, including travelling down a flight of steps end-over-end as it stretches and re-forms itself with the aid of gravity and its own momentum, or appear to levitate for a period of time after it has been dropped. " With the help of slinky, we can add a very important dimension to the Build-Measure-Learn Loop - TIME. Optimising efforts is core to the Lean Startup. You want to get to the learning as fast as possible. Slinky allows to show the value of fast learnings. The same amount of validated learning (number of loops in slinky) can be generated in the time x (on the left) or in the optimised time of y (on the right). The tool of reducing overprocessing is in Lean Startup the MVP. Slinky is also able to illustrate the function of pivots. Pivots can be seen as a change in strategy and thus in the direction of the innovation initiative. This analogy is illustrated in the following picture. With the same amount of learning cycles a company can pivot to different directions. Pivoting is core to the lean methodology. An entrepreneur will have to pivot his/her business, since the assumptions in the beginning are not reliable forecasts. Although entrepreneurs have to learn and to pivot depending on that learning, it is also important to fix some assumptions when validated. By neglecting to fix assumptions, entrepreneurs risk the effect of analysis paralysis. Analysis paralysis is the behavior, where an entrepreneur is looking to validate the one assumption through more and more proof, but without a real advancement in learning. The effect of fixation e.g. for the customer problem the entrepreneur tries to solve can be illustrated with the help of a stick. The stick in slinky represents the fixation of the customer problem. The fixed customer problem allows us to iterate around the customer problem in order to find the right solution and to develop the right product. There are still a lot of ways to solve the problem, but the process of finding the right solution is guided by the customer problem and thus enables the team to focus. On the other side, developing a solution without having a problem validated or even engaging in developing the product without a validation of the problem, can be understood as premature scaling. Most of entrepreneurial initiatives actually scale prematurely, it is also the number one cause of startup failure. But developing a product without a validation of the problem and the imagined solution doesnt only cost the initiative a lot of money. It also costs flexibility. The entrepreneurial team gets mentally inflexible through biases, namely the sunk cost fallacy. Overconfident entrepreneurs tend to develop a product without having achieved a validation of the problem. The development efforts lead to a sunk cost fallacy, where entrepreneurs tend to invest more into this direction to legitimiate previous investments (e.g. money, time, energy). The barrier to get away from this initial investment is high. The sunk cost fallacy prevents entrepreneurial initiatives from objective learning. The result of fixing more and more assumptions is illustrated in the pictures below, where the stick gets replaced by a small bottle and a larger bottle. But flexibility does not only decrease through fixing assumptions, flexibility can also decrease through outside conditions. This can be illustrated putting slinky into the cover of a dvd box. The cover represents a restrictive culture, leadership and structure in which the entrepreneurial team operates. These conditions limit the possible learnings for companies. Culture of mistrust, anxiety to fail, centralized decision making or outcome-oriented goals are conditions that prevent the entrepreneurial team from learning and thus from adapting to an uncertain environment. Let me know what you think about Slinky as a representation of a continuous Build-Measure-Learn loop and tell me about other possible elements/thoughts of Lean Startup that you can illustrate with Slinky.